> Research Library > Websense > Download your copy of the Miercom Security Effectiveness Test Report today. Most security effectiveness tests take a sample of known malicious content, and see how many threats each solution can catch. Unfortunately, stopping known threats — those with a known signature, reputation or destination — isn't enough to protect real-world networks. Solutions must also stop unknown threats, including zero-day exploits, timed attacks and spear-phishing, plus lures and redirects hidden in social networking. So we designed a new test, along with leading independent test laboratory Miercom*, that simulates a typical day on a network like yours. We put a large sample of web traffic of unknown nature through our TRITON-powered Websense® Web Security Gateway solution, along with competing web gateways and firewalls. Each solution had a fair and equal chance to analyze, classify and block threats as it would on your network. The results are in. The implications are clear: when you are facing real-world network traffic — not just a canned collection of known threats — features such as the real-time, inline defences of the TRITON architecture have an unmistakable advantage. 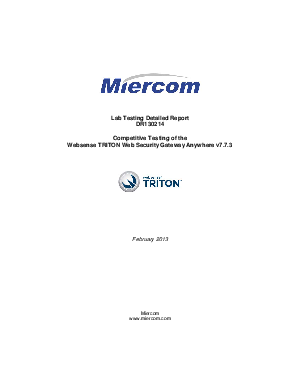 Download the Miercom Security Effectiveness Test Report today. Once you read it, you'll understand what we mean when we say "Websense TRITON stops more threats — and we can prove it." *The test was conducted in January 2013, audited by the Miercom, and used a data set of over 2.2 million live web requests of unknown nature.